By some strange convergence Bauhaus overtook me. On a whim I bought this short book a few months back, with only a vague notion of the school and its style. Then several weeks ago I attended a small but remarkable concert and one of the performers (Dominic Johnson of Chicago) played beautiful electric violin (and beats) over several Bauhaus era silent films. And just two days ago I toured the large retrospective exhibit on Laszlo Moholy-Nagy at the Art Institute of Chicago. You might say it was meant to be. This short book from 1965 is the author's reflection on the many facets of Bauhaus, including the style, the school, the players, the philosophy, some misconceptions, and his ideas about "the future". It has the feel of a time capsule and, regardless of the "failings" of this school, there is a captured energy and optimism that is refreshing. Life is about possibilities. And new ideas. Inspiration. Collaboration. Trial and error. Change. And at some point, reflection. This is a nice starting point on Bauhaus for the uninitiated. It will leave you wanting more. And that is quite the point. Over the years I have heard so many definitions of Bauhaus that I decided to find a book that would help me. This is a very good book that will provide you with a foundational understanding of a very complex concept - often 'borrowed' by others. The first 97 pages on the education of students in the Bauhaus is brilliant. The last 13 pages on Modernist town planning is, in hindsight, an unmitigated disaster. 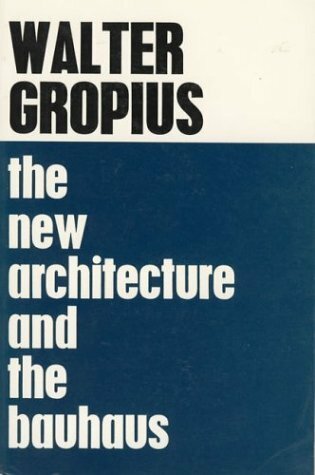 Molto interessante, in poche pagine Gropius in persona racconta la scuola del Bauhaus e la sua idea di Architettura che ha cercato di realizzare. Dopo una breve ma profonda citazione dei temi che hanno dato terreno fertile a una scuola così singolare, offre uno spaccato profondo dei valori cercati, delle tecniche insegnate e del percorso formativo svolto da uno studente Tipo. Scritto nel '34 durante il suo esilio in Inghilterra, un anno dopo la chiusura dell'ultimo Bauhaus forzata dal governo tedesco.